Life Changers - A New Found Love for Lush - Sugar, Darling? For quite a few people including myself up until a few months ago, Lush are just purveyors of pretty and amazing smelly novelty bath goodies, the inventors of the bath bomb. Many people know them for using a lot of natural ingredients and for being anti animal testing and also for making the world within a 30 feet radius of one of their shops smell like a fizzy citrus-floral explosion. What I never thought was that Lush would make such an amazing difference to my life one day. 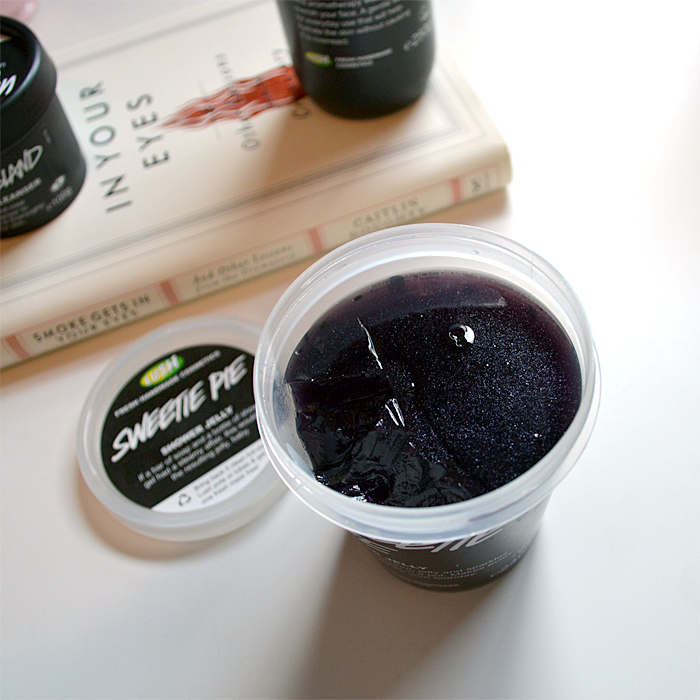 With that in mind, I thought I'd share with you today three of my favourite Lush products. I simply have to begin with the product that has really been a life changer for me - Ultrabland Facial Cleanser (£7.25 for 45g or £11.50 for 100g). Since my early teens I've been plagued with really oily, blemish prone skin and suffered from acne on countless occasions. I couldn't tell you how many products I've used to try and combat this, high end, high street store and prescribed and nothing has ever really worked, not even taking different pills to try and settle down my hormones. Within two weeks of using Ultrabland my skin was so much happier - softer and much less red and sore with far fewer spots and blemishes and my visible pores had settled down wonderfully. It really has made such a difference to me, I adore it! This is a really rich and creamy cleanser that contains lots of lovely natural oils and beeswax which are really gentle on your skin but work wonders removing makeup with the greatest of ease, even waterproof mascara and matte lipsticks that can stain your skin! I was worried that the oils would make my already greasy skin even worse but it was quite the opposite, I think that now I've stopped using targeted acne control product that contain lots of chemicals that dry your skin mine isn't overcompensating any more by producing even more oil. Two other key ingredients are rose water which soothes and calms redness and honey which is both moisturising and antiseptic, a trait I didn't know it had! Because it's so gentle this is a product that's perfect for all skin types, especially if your skin needs a little extra TLC. It's lovely to use too, after removing as much of my make up as I can with warm water I pat my face dry and then spend a good few minutes massaging Ultrabland into my face and neck before removing it with a clean damp cloth. If you only ever try one thing from Lush make it be this, it truly is a wonder. 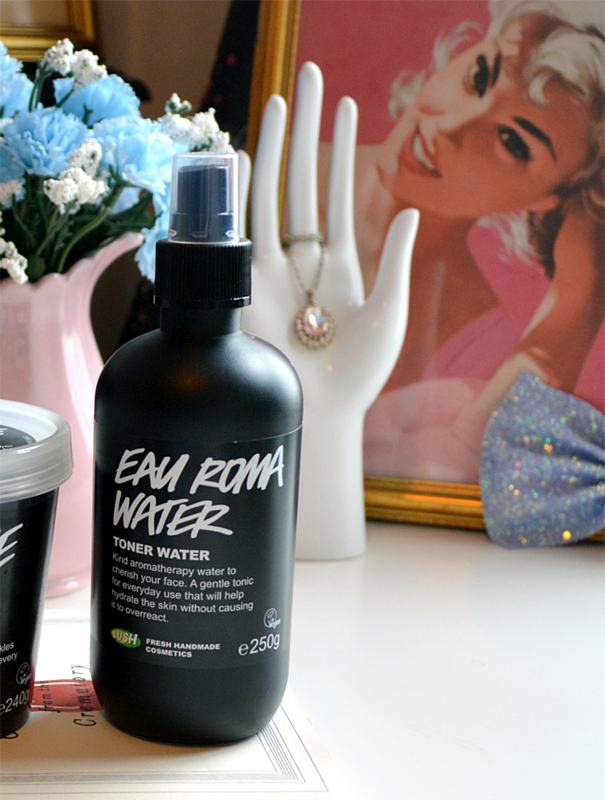 After I've done my Ultrabland thing I give my face a generous misting of Eau Roma Toner Water (£4.25 for 100g or £7.25 for 250g) before applying my eye cream. Another product that is great for sensitive skin, this toner again contains rose water which soothes and calms redness as well as calming lavender water which to soften your skin even more. Like the bottle says, it's aromatherapy for your face, making my skin feels cooled, refreshed and healthy with a lovely relaxing scent to treat your nose to too! This is the first toner that's ever felt really healthy for my skin as most others have either stung a little or made my skin go an alarming shade of red. Again if your face needs a little TLC this is the toner for you, my little tip is to keep it in the fridge so it's even more cool and lovely when you give it a spray! 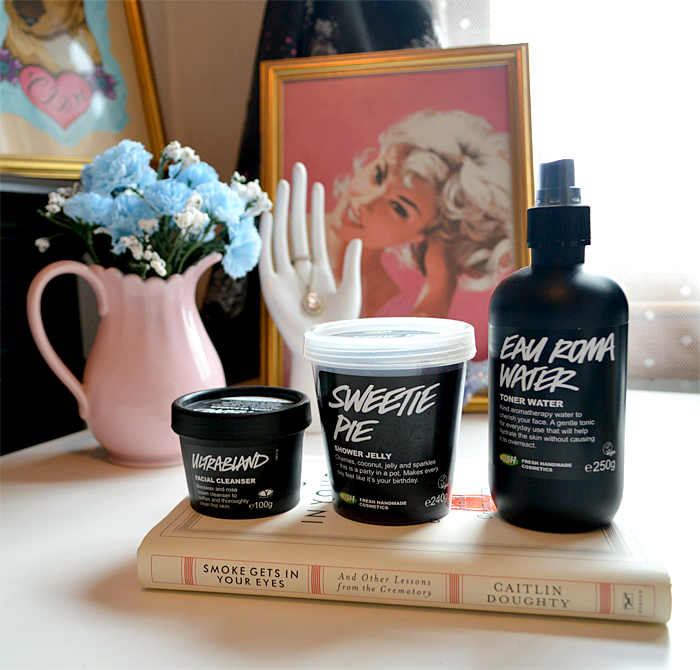 The last of my new Lush loves is their Sweetie Pie Shower Jelly (£3.50 for 100g or £6.95 for 240g). It describes itself as a party in a pot and boy is that an accurate description! Sweetie Pie is super fruity and sweet, it reminds me of the scent of gummy jelly candies and even has super fine iridescent glitter in it so it's like you're having a disco every time you have a shower! I know this won't be for everyone but I just adore sugary fruity scents so this is right up my alley. The other great thing that I've found from using Sweetie Pie is that the little red bumps that covered my upper arms have nearly all gone. I've always been a bit sensitive to certain shower gels (I can't use Avon ones as they sting a certain area that you really don't want stinging...) so I've always gone for those that label themselves as gentle and moisturising but despite this and using scrubs those pesky bumps on my arms have never shifted. Perhaps it's the cypress oil within the jelly that has done it as it's meant to be calming and toning but I think again it's a case of not using as many synthetic chemicals on my skin. Of course it's also really fun to use a bath jelly rather than a normal gel, I just tear a bit off and rub it into a bath puff with a little water to start the seaweed extract getting frothy - that's what makes it jelly like! Apparently it also works well frozen so it's more like a solid bar so I'll be giving that a go soon too! 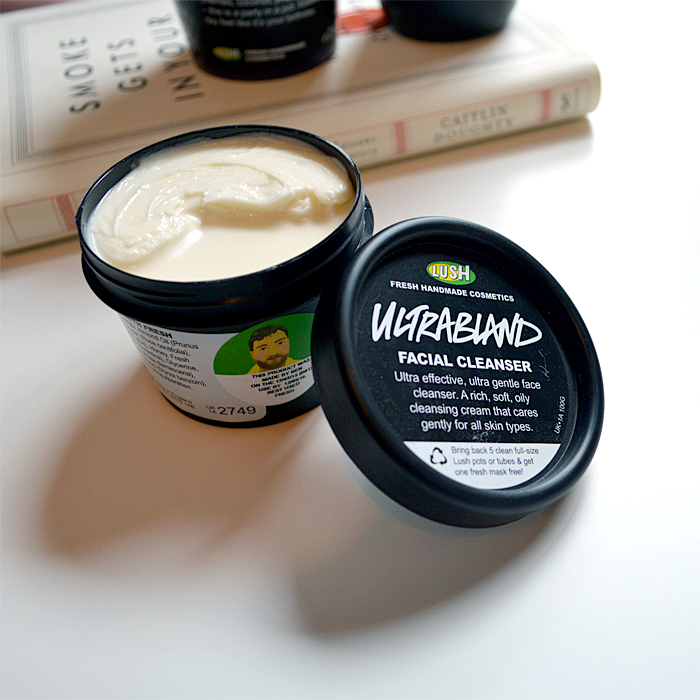 So, that's me sharing my new found love for Lush - do you have any favourite products that you think I should try next?